"DSN" stands for correspondence with Doris Dolores Smith Crawford Norman, webmaster of the site http://users.moscow.com/dnorman/, excerpts from which are represented below and in subsequent chapters as ~archl, ~arch2, ~arch3, ~arch/ancestors, ~smith/jesse, ~smith/jessewill, ~smith/jerome, and ~smith/eugene. My grandfather, Francis See Smith, spent a lifetime spelling out his middle name for people who thought he'd given them an initial. We have to go back several generations to find its source: as far back as can be reached on this particular branch of The Tree. It returns us to New Castle County, Delaware, where Joseph Hedges [Sr.] had either been born or brought as a child. (See more about Joseph and the Early Hedgeses in Chapter B-2.) The town of "Willington" was laid out near old Fort Christina in the 1730s; King George II granted this settlement a royal charter in 1739 that renamed the borough "Wilmington." Delaware would declare its independence from both Great Britain and Pennsylvania in 1776; a year later, Wilmington would be occupied by the British after the Battle of Brandywine. There is no guarantee that Appoquinimink's Peter See was Mary See's father, since quite a few Sees were living in New Castle County at this time. ~a's Dictionary of American Family Names interprets the surname "See" as either English or German, for someone who lived by a sea, lake, or watercourse. It may also have been derived from the French village of Sy, "situated to the west of the Northern part of the Argonne Forest in the old province of Champagne." In the early 17th Century a family named Sy, who were Protestant Huguenots and subject to persecution, left their native village for the more tolerant environs of Calais. There Isaac Sy was born c.1634: the son of Jean Sy, a "'lifetime resident of Nielles les Calaisis' 96 kilometers south-southwest of Calais" (~sees/hall). Isaac Sy occupies the same legendary-patriarchal niche as Jan Joosten, Joseph Hedges and William Burns; but most sources agree he emigrated to Mutterstadt in the Rhineland Palatinate by 1655. Two years later Isaac was living in nearby Friesenheim (the present-day Ludwigshafen) and on Dec. 11, 1657 he married "Esther [Sy], daughter of Pierre Sy" in the French Church of Mannheim (across the Rhine from Friesenheim). "Conditions in Germany became intolerable because of the daily threat of invasion of the Palatinate by the armies of Louis XIV, and other German Princes who were waging that 'Thirty Years' of religious wars against the followers of Martin Luther" (~sees/hall). Isaac and Esther Sy left Mannheim after 1666 and eventually reached New Amsterdam aka New York, possibly on the Diamond (arriving Oct. 22, 1674) that brought Sir Edmund Andros to govern what till then had been New Netherland. "Our See family managed to bring with them some household goods, and a few choice treasures. Among them the Holy Scriptures in French, the French Psalm Book, and the highly prized Book of the Martyers [sic]. It is said that if the Book of the Martyers [sic] had been found in possession of our refugees by the armies of Louis XIV, heads would have rolled" (~sees/hall). There are two additional sons of Peter and Petronella, whose descendants, I am confident, remain in Delaware. To date this writer has followed only the lines descending from Derick, the oldest brother. There are Sees, Seas, Seays, et. al. spellings who must be descended from Isaac and James, the two younger sons of Peter. James is mentioned in Derick's will, and I have seen evidence that Isaac also had posterity. It is hoped that this old researcher will yet be granted the time needed to fetter [sic] out the records of the two other brothers. Apparently that wish was not granted. No confirmation can be found that the Peter See who married Miss Own/Owen and fathered Mary See was the son of either Isaac or James See; he at least was not Derick See's son Peter See (born 1717) who did have a daughter Mary See but whose wife was née Mary Jeton. (After Peter's death, this Mary would marry his brother Abraham See.) Yet the testimonial below by our Mary See's daughter/namesake, concerning her family's Huguenot origins, indicates descent from Isaac Sy is at least plausible. Lafferty is defined by ~a's Dictionary of American Family Names as "Irish (mainly northern Ireland): reduced Anglicized form of Gaelic Ó Fhlaithbheartaigh or Mac Fhlaithbheartaigh, 'descendant (or son) of Flaithbheartach', a personal name composed of the elements flaith 'prince, ruler' + beartach 'doer of valiant deeds.'" This would seem to introduce an almost-unique Irish strain into Fine Lineage; but in her testimonial below, Mary Lafferty said her father's ancestors came from Scotland. Then again, Ulster saw a major influx of Scots through the 17th Century; a quarter-million of these Scotch-Irish traveled to America between 1717 and 1770, with New Castle DE being one of their prime entry points. * Francis Lafferty (a daughter): born circa 1796 in Delaware; died young? The 1810 census shows an "Archy Lafferty" living in St. George's Hundred, which is north of Appoquinimink Creek and south of the Chesapeake & Delaware Canal (whose construction began in 1804, effectively replacing St. George's Creek); its principal town is Middletown. 1820's census shifts Archibald Lafferty to Pencader Hundred, north of the canal and south of the Christiana River; its principal town is Glasgow. Clermont County, just east of Cincinnati, was created out of Hamilton County in 1800. Union Township is on its western border, south of the Little Miami. Archibald Lafferty [Sr.] died there on Aug. 30, 1829 and was buried in Old Guinea Pike Cemetery, north of the river in Miami Township. Click here to see a map of what's now called Union Cemetery; click here to see Archibald's gravestone. (Both courtesy of ~union and the Clermont County Genealogical Society.) The stone appears to read "Aged 73 years & 9 months," but could arguably read "78 years" instead. If "Mary Laferty" is Archibald's widow, there should be a Female/60s (not 50s) in her household. One of the Female/20s may be her youngest child, Hannah Sophiah Lafferty, who married Samuel Anderson (the lone Male/20s?) in Clermont County on Dec. 1, 1825—as per ~f, which separately says Hannah died in Miami Township on Sep. 23, 1857. However, her gravestone in Union Cemetery clearly reads: "In memory of HANNAH SOPHIAH, wife of Samuel ANDERSON, who departed this life Sept. 22, 1837, aged 31 years and 1 day." (Click here to see it.) Another stone appears to belong to her widower—a Samuel Anderson who died Sep. 18, 1845, aged 39. There is no way to determine whether they had any children; several Anderson stones in Union Cemetery have unreadable dates. In the 1840 census Mary Lafferty's household remains in Miami Township, listed nine lines above that of Josiah Smith who married Mary's daughter Susannah Lafferty on Apr. 20, 1825. According to ~f, James Lafferty married Mary A. Bacon (born c.1795) circa 1817, evidently in Delaware. (Three Bacon households are listed in that state's 1810 and 1820 censuses, all in Sussex County rather than New Castle.) ~f adds that James and Mary had five children: Mary Ann Lafferty (born c.1818), Frances Lafferty (born c.1820), Hannah Lafferty (born c.1822), "Elixa" Lafferty (born c.1824), and Archibald Lafferty [III] (born c.1826). However, these birthyears—and the spelling of one daughter's name—are not borne out by future censuses, meaning the estimated wedding year may also be a few years early. Between 1830 and 1834, James and his brother Archibald [Jr.] moved from Clermont County to Cincinnati. That city's 1834 Directory (available at ~a) lists "Lafferty, Jas., drayman, 12th b[etween] Main and Walnut" and "Lafferty, Archibald, drayman, 6th b[etween] Smith & Mound." Both reappear as draymen in the 1840 Cincinnati Directory (available at ~1840/cinc), with James at "r[ight] c[orner] Grant & Elm" and Archibald at "r[ight] N[orth] s[ide] 6[th Street?] b[etween] Smith & Fulton." In the 1842 Cincinnati Directory (available at ~morgan), James remains at "Grant Corner Elm," while Archibald is simply at "Grant St."
The middle three are James's children Frances Lafferty Tasso (born c.1828 in Ohio), Eliza B. Lafferty (born Nov. 1829 in Ohio), and Archibald Lafferty [III] (born c.1837 in Ohio). "Julius Tosso/Torre" is Frances's husband Julius Tasso, and "Ellexina" is James's niece Alexenia A. Brown (ditto). It would appear that ~f mixed "Eliza" with "Alexenia" to produce "Elixa." The same 1850 census shows Archibald [Jr.], a laborer, living with Rachel Lafferty (aged 44, born in Ohio) and two Kentucky-born children, Elizabeth Glenn (aged 14, checked as "male") and Catharine Glenn (aged 12)—perhaps Rachel's daughters from a previous marriage? Also part of the household is Emaline Watkins (aged 22, born in North Carolina, unable to read or write) whose color field is marked "B" for black, but she is included among the "Free Inhabitants in the 10th Ward of Cincinnati." John Lafferty, Archibald and Mary's eldest child, married Sarah Patterson Townsend (born c.1804 in Bangor, Maine) on Mar. 8, 1825; as per ~f and ~tasso/john. ~a's Marriage Records of Hamilton County, Ohio states the wedding was performed on that date in that county by minister William Burke, and names the bride Sarah Townshend. In the 1850 census John, Laurinda, and baby Arria shared their home in Clermont County's Jackson Township with Laurinda's aunt Mary Lafferty. In 1880 all four Barr children still lived with their parents in Jackson Township. John Barr died Feb. 8, 1899; a year later his widow Laurinda was living with son James's family in Batavia Township. Laurinda Lafferty Barr died May 24, 1901 (as per ~f), just shy of turning 75, and less than three months before the birth of her namesake granddaughter. In April 1843 James Lafferty's daughter Mary Ann Lafferty (born c.1820 in Delaware) married Samuel Blair (born Dec. 2, 1816 in Harrison County KY). He had come to Cincinnati in 1840 "and engaged in the ice business" (as per ~samuelblair). Mary Ann and Samuel had seven children: James R. Blair (born c.1844), John M. Blair (born c.1845-46), George W. Blair (born c.1851-52), Charles E. Blair (born c.1853-54), Cora May Blair (aka "Corra": born Mar. 1856), Archibald R. Blair (aka Archibald L. Blair and "Archie": born Feb. 1860), and Ida Blair (born c.1865). In the 1870 census, Samuel's fortune has grown to $50,000 in real estate and $9,000 in personal estate. Eldest son James R. Blair has left for parts and fate unknown; second son John M. Blair lives one house away, with wife Mary Jane Blair (born c.1840) and children Samuel A. Blair (born c.1863) and Jennie G. Blair (born c.1867). John and his brother George W. Blair work as clerks in the ice house; George remains under the parental roof with Charles, Cora May, Archibald, and Ida Blair, plus cousin Eliza B. Lafferty. Circa 1873, Cora Blair married Herman Matthews aka Herman Mathews (born c.1855 in Prussia). They and their son Samuel Blair Matthews aka Mathews (born May 1874) are boarding with Samuel and Mary Ann on Cincinnati's Twelfth Street in the 1880 census, along with Cora's younger siblings Archie and Ida and cousin Eliza B. Lafferty. Five of Samuel's children, three sons and two daughters, were alive at this time; it is unclear whether the same was true of Mary Ann Lafferty Blair. Samuel himself appeared in the 1890-91 Chattanooga Directory (available at ~a) as president of both Lookout Ice & Cold Storage and the firm of Biese, Dickinson & Blair (924 Market St., "carriages, buggies, wagons and agricultural implements"). Samuel's personal address was 519 E. 4th St., where his survivors reside in the 1900 census—but his widow is not Mary Ann. This translates to Samuel Blair Matthews having married Mable (Mabel?) E. aka May C. [surname?] c.1899, and their having sons Raymond Matthews (born c.1908) and Harold B. Matthews (born 1910). Meanwhile, Blair's younger brother Earl Matthews (born June 1880) had married Virginia "Virgie" E. or L. [surname?] (born July 1880 in Tennessee, father from North Carolina, mother from Virginia) c.1898. Two years later they lived three doors down from Eliza and Cora, and Earl worked as a "dealer in meat"; their son Charles M. Matthews was born c.1904-05. Cora, Earl, and little Raymond are all absent in 1920. "Sam B. Mathews" is now employed in the shipping department of a hosiery mill; his wife Mable is a private schoolteacher; they live with 10-year-old Harold on Bailey Avenue in Chattanooga's 9th Ward. Meanwhile Earl's wife Virginia (missing from the 1910 census, where Earl's marital status is "M" rather than "W" for widower or "D" for divorced) has reappeared in 1920 as the wife of Pennsylvania-born city policeman Lee G. Way (transcribed as "Les Woy": aged 44); they live with 15-year-old "Charles Mathews" on East 15th Street in Chattanooga's 9th Ward. The three are still together in 1930, with Charles working as a road machinery salesman; but his Matthews relatives have retreated into the shadows, along with most of their Blair uncles and aunts. The only one tracked into the 20th Century is Archibald Blair, who c.1882 married Agnes [surname?] (born Aug. 1860 in Ohio, parents from Germany); they had a daughter, Edna Blair (born c.1884). In 1900 Archie and "Agnas" live in Chattanooga's 1st Ward (not with Edna but Mary Peak, a 17-year-old African-American cook); Archie is working as a whiskey agent. Possibly as a result, Agnes is a widow in 1910; she and Edna—a divorcée who reclaimed her maiden name—share their home on Chattanooga's Walnut Street with one servant and seven lodgers. Elizabeth Roberts Lafferty had both the largest and (thanks to ~f and ~tasso/brown) most thoroughly-documented family. Her husband Benjamin Brown was born Apr. 28, 1799 in Carlyle Township, Bucks County PA, the son of Benjamin Brown [Sr.] and Mary Houston. According to ~listsearches/lafferty, the Brown family were Quakers. Benjamin married Elizabeth in Miami Township on Feb. 24, 1825: the first of four Lafferty marriages that year, followed by John and Sarah's on Mar. 8th, Susannah and Josiah's on Apr. 20th, and Hannah and Samuel's on Dec. 1st. By 1860 Benjamin's real estate holdings had grown to $5,000; in that year's census, only the four youngest children still live with their parents. Benjamin Brown died in Goshen Township on May 26, 1863; his widow Elizabeth went on to live with daughter Mary and son-in-law John K. Hartman in Jackson Township, near Williamsburg post office, in 1870 and 1880. Elizabeth Roberts Lafferty Brown died aged 82 on July 2, 1886 and was buried with Benjamin in Goshen Cemetery. ~tasso fills us in about this exotic family. Most censuses and web sources spell the surname "Tosso," but ~tasso's comprehensive authority is supported by ~a's Dictionary of American Family Names, which defines Tasso as Italian for someone who lived near a yew tree or was thought to resemble a badger (if not both); Tosso is not recognized. * Adel Tosso (aged 7), "at home"
~history/hamilton mentions that Carthage, "one of the oldest and largest suburban villages in the vicinity of Cincinnati" (and most of which is in Mill Creek Township), was incorporated on Sep. 21, 1868, with "Julius Tosso" was one of its trustees. * Mattie Tasso (aged 49), "keeps house"
* Carrie Tasso (aged 26), "at home"
* Frances Tasso (aged 20), "at home"
By 1900 the Tassos (again "Tosso") were back in Carthage Village on 2nd Street; Julius is again a scale maker, and his father's birthplace has changed from Mexico to "At Sea." Caroline, a dressmaker, is the lone child still living with her father and stepmother; four boarders (florist, stenographer, spring fitter, and painter) make up the rest of the household. By 1910 Julius and Martha have moved in with Julius Jr. (a plasterer and contractor) and his family in Hamilton, Butler County OH. Julius Tasso Sr., aged 82, is still working as a professional scale maker; he died June 2, 1919. Julius Tasso Jr. died in Hamilton in late July 1944 and his wife Ariamento a week later, on Aug. 2nd (as per ~tasso). I was born in the State of Delaware, County at New Castle, on the 16th of June 1799. My parents were also born in same State and County. My mother's name was See. The Sees were from France, left on account of persecution, were wealthy but could not fetch their money. Glad to get off with their lives. Her grandmother [Peter See's mother?] was a Vandergrit. They were of German descent. My mother's mother was an Own. The Owns, an amalgamation of high and low Dutch and Welsh. My father's mother was of English extraction, his Great Grandfather came from Scotland. I emigrated with my parents to Ohio in 1821. This testimonial—transcribed by an unspecified Smith in 1883, retained by Leanna Smith in the SFA, copied in 1950 by Leanna's niece Gertrude Smith and again in 2007 by Gertrude's cousin Mellie Smith Nash—was always attributed to Susannah Lafferty Smith. The SFA refers to her as "Mary S." or "M. S."; her having (if not using) her mother's first name was thought natural for the family's eldest daughter. However, ~f and ~archl give Susannah a different birthdate—Oct. 8, 1801—which is verified by Susannah's being 48 years old in Clinton County OH's 1850 census. "Mary Lafferty / died Sep. 30, 1883 / aged 84 ys, 3 ms, 14 ds." Why she was excluded from Archibald and Mary's Family Group Record (as listed by ~f) is unknown. The 1850 census shows "Mary Laferty" (aged 51) living with her niece Laurinda Barr, Laurinda's husband John and their eight-month-old daughter Arria in Clermont County's Jackson Township. There Mary would remain for the rest of her life, though not with the Barrs; by 1860 she was a "merchantess" with $1,000 in real estate and $800 in personal estate, living alone in or near Monterey (east of Stonelick, northeast of Batavia). By 1870 "Mary Laferty" has amassed $2,000 in real estate and $1,000 in personal estate, is running a dry good store and heads a household consisting of store clerk Nancy Hunter (aged 33). In the 1880 census Mary (aged 80) and Nancy (aged 41) are still together at the Monterey dry goods store—with the "married" column checked for each. Since Susannah didn't write the ancestry-recap above, that accounts for why it wasn't signed "Smith"—although after Mary Lafferty died in 1883, her testimonial got copied by a Smith: most likely one of the late Susannah's sons or their wives. ~f reports that Susannah died on Sep. 28, 1876 (a date missing from the SFA, along with her final resting place). By then she was the mother of three, grandmother to fifteen, and longtime widow of a Smith from New Jersey; about whose family see more in Chapter S-1A. The seven children of Alexenia A. Brown and John Wrench were: Viola Wrench (born c.1857 in Miami Township, Clermont County OH; died by 1860? ); Charles B. Wrench (born c.1858-59 in Peoria IL); Hannah V. Wrench (born c.1859 in Peoria IL; died by 1870? ); Flora Etta Wrench (born Aug. 19, 1862 in Peoria IL, married Joseph Benton Mackenzie in Eureka KS, died 1951); James Alexander Wrench (born c.1863-64 in Peoria IL); John Lucius Wrench (born c.1866 in Groveland IL); Elizabeth B. "Bessie" Wrench (born Feb. 27, 1870 in Groveland IL, married Owen S. Gibson in 1911); and as per ~f, ~tasso/brown, and the 1860 census. The six children of Elizabeth Ann Brown and Paul Rust Cliver were: Wilber Trimble Cliver (born July 25, 1852 in Cincinnati; died July 30, 1925 in Topeka KS); Louella Belle Cliver (born c.1854 in Cincinnati); Benton Cliver (born c.1856 in Clarksville OH); Benjamin Brown Cliver (born Nov. 5, 1860 in Clarksville OH; married Kate Phares in 1892; died Sep. 6, 1907 in Waterloo IA); Ralph Paul Cliver (born July 1, 1862 in Clarksville OH); and Frances Lusby Cliver (born Dec. 2, 1870 in Clarksville OH; died [when?] in Lookeba OK); as per ~f. The four children of Alexander C. Brown and Hannah O. Roberts were: Joanna Roberts Brown (born c.1869 in Mediapolis IA); Elizabeth B. Brown (born c.1871 in Mediapolis IA); Alexander Clifford Brown (born c.1873 in Mediapolis IA); and Cynthelia Maude Brown (born c.1875 in Mediapolis IA); as per ~f. ● ~archl spells Mary See's mother's maiden name "Owen" rather than "Own." ● Delaware's "hundreds" were used as tax and voting districts as late as the 1960s, and can still be found today in real estate titles. ● Besides Peter See in Appoquinimink Hundred, the 1800 census lists three other Sees in Delaware: William in Pencader Hundred, and Abraham and William in St. Georges Hundred; all in New Castle County. 1810's census shows only "Aliar See" in Glasgow, New Castle County. ● The backgrounds of Isaac Sy and his descendants were largely extracted from ~see/hall and ~see/hudsonvalley. ● Petronella Storm (or De La Montagne)'s first name also appears as "Peternella" and "Pironella." ● Some claim the Sees of New Castle County DE were unrelated to Isaac Sy's clan in Westchester County NY, and descended instead from a different French Huguenot family headed by Richard Seay(s), who surveyed part of St. George's Hundred in 1675. This claim is discussed (and dismissed) by ~sees/seay and ~sees/seays. ● Some Sees may be of Irish descent, their surname derived from O'Shea (O'Shee, O'See); as noted by ~sees/seay and ~sees/irish. ● A John Lafferty was christened Nov. 17, 1792 at Holy Trinity (Old Swedes) Church in Wilmington DE; but he was the son of a Francis Lafferty, not Archibald. ● ~f variously spells Hannah Lafferty's middle name as Sophiah, Sophia, and Sophy; "Sophiah" appears on her gravestone. One ~f entry estimates Hannah's birthyear as 1803, her sister Elizabeth's as 1801, and their brother Archibald's as 1796. ● In Sussex County DE's 1810 census, Harry and Sam Bacon head households in Little Creek Hundred, and Betty Bacon in Broad Creek Hundred. In 1820 Samuel Bacon has moved to Broad Creek, while Henry and John Bacon are in Little Creek. ● ~a's Marriage Records of Clermont County, Ohio, 1800-1850 notes that a "James Laferty" and "Eve Donely" were married by "Wm. Eweing, J.P." on Jan. 3, 1819—but this could not have been our James, unless he came to Ohio a few years before the rest of his family. ● The 1840 Cincinnati Directory includes birthplaces. James Lafferty's is "Del.," while Archibald's has shifted to "Md" (but would return to Delaware in the 1850 census). ● The present author assigned James's son Archibald Lafferty the suffix "II" to help differentiate him from James's father—Archibald [Sr.]—and James's brother—Archibald [Jr.]. Archibald [III] does not appear to have served in the Civil War, though that might explain why he can't be found after 1860. ● Neither Rachel Lafferty nor Catharine Glenn can be located after 1850. In the 1870 census an Elizabeth Glenn (aged 34, birthplace Kentucky) lives in Mount Washington, Bullitt County KY with three youngsters: Adron Hall (aged 15), Beldora Hall (aged 13), and Eller V. Hall (aged 10). ● An ~f entry states John Lafferty and Sarah Patterson Townsend were married in Miami Township, Clermont County OH; but this is trumped by ~a's Marriage Records of Hamilton County. ● Our John Lafferty should not be confused with a John Lafferty who was born in Delaware on Feb. 7, 1796, the son of Samuel and Eleanor Lafferty, who also had two daughters: Nancy Lafferty Nail and Nellie Lafferty Boston. This Lafferty family moved to Fairfield County OH, where John married Sarah Lewis (born c.1798 in Pennsylvania) in Nov. 1817; Samuel Lafferty died there in 1826 or 1827. John and Sarah settled on an 80-acre farm in Hancock County's Delaware Township c.1832. They had eight or nine children: Nancy Marie Lafferty (1819-1866), John Lafferty [Jr.] (born c.1822), Leroy S. Lafferty MD (born Oct. 11, 1829), Martha A. Lafferty (born c.1830-32), Lewis S. Lafferty aka S. L. Lafferty (born c.1835), Daniel L. Lafferty (1839-1852), Tillman Lafferty (1840-1877), H. C. Lafferty (born c.1842) and/or Harrison L. Lafferty (also born c.1842). John served as justice of the peace 1835-1853 and county commissioner in 1845. In 1860 he and Sarah lived in Mount Blanchard OH with son Harrison, six-year-old Squire Lafferty, and 19-year-old Corner Hill. John Lafferty died Mar. 9, 1868 and was buried in Mount Blanchard Cemetery. (As per ~archiver/fairfield, ~boards/hancock, and ~heritage/hancock, ~a's "Drake Family Tree" and "Lafferty Family of NW Ohio.") Dr. Leroy S. Lafferty is mentioned in ~history/hancock as the son of "John and Sarah (Lewis) Lafferty." ● This John Lafferty's father should not be confused with a different Samuel Lafferty, born in Virginia, who lived in Ohio's Champaign and Union Counties (as per ~heritage/union); his family also included a John Lafferty and several Sarah Laffertys. Yet another John Lafferty lived in Vienna Township, Trumbull County OH in 1830 and 1840; still more lived in Harrison and Richland Counties in the 1840 census. ● ~a's OneWorldTree provided many details about Laurinda Lafferty Barr's husband and children. ● Laurinda Lafferty Barr's being Kentucky-born is found in the 1900 census, where her father is correctly shown as Delaware-born; her mother's birthplace is listed not as Maine (as it is in the 1880 census) but Ohio. ● Arria Andromeda Barr's husband Newton Hutchinson was a widower; his first wife was Lucinda Fitzwater (1840-1883). ● ~clermontbirths/1856 says "Barr Dorien D." was born Apr. 10, 1856 in Jackson Township to John Barr and "Larinda" Lafferty. ● In the 1930 census, D. D. Barr's widow Laura, daughter Laurinda M. and son James D. (a sales promoter for auto accessories) live in an apartment building at 806 Washington in Evanston IL. Laurinda May Barr was a public schoolteacher in 1920 and 1930; she died June 1990 in Illinois, according to ~a's Social Security Death Index. ● Mary Ann Blair's being Delaware-born was the key to the present author's identifying her as James Lafferty's eldest daughter (as well as her sister Eliza's longtime landlady, and predecessor as Mrs. Samuel Blair). Their other sister, Hannah Lafferty, may have married or died (or both) by 1850; nothing further can be discovered about her. ● The Blair household has a live-in servant in three consecutive censuses: "Cathe Collins" (aged 18, from Ireland) in 1860; Mary Eickbush (aged 19, parents from Germany) in 1870; Laura Obendorf (aged 20, parents German-born) in 1880. ● In the 1880 census, Mary Ann Lafferty Blair's birthplace has changed from Delaware to Maryland; ditto that of Eliza B. Lafferty's parents. ● Herman Matthews was the son of Henry Matthews (born in Baden) and Maria or Mena Matthews (born in Prussia). In 1870 Herman lives with them and five siblings in Cincinnati's 1st Ward; aged fifteen, he works as a cigarmaker. ● Herman and Cora's surname is spelled Matthews in 1870, 1900, and 1930; as Mathews in 1910 and 1920; and semi-illegibly (transcribed as "MacHeos") in 1880. Their son Samuel Blair Matthews appears as "Blair MacHeos" in 1880, "Samuel B. Matthews" in 1900, "S. Blair Mathews" (transcribed as "A. Plois Mathews") in 1910, and "Sam B. Mathews" in 1920. ● Benjamin Brown's first name is abbreviated to "Benjm" in the 1840 census. A Benjamin Brown served as Goshen Township commissioner in 1852-55 (as per ~goshen). ● Alexenia A. Brown's first name is variously spelled in censuses as "Alexina," "Alexene," etc. Her husband John Wrench appears to have been a widower: in 1850 he lived in Peoria IL (working as a carpenter) with Martha Wrench (born c.1824), one-year-old Alonzo W. Wrench, and plasterer James Brown (born c.1831—no indication whether he was related to Benjamin Brown). The family appears as "Rench" in Groveland's 1870 census; father John is now a farmer with $5,000 in real estate and $600 in personal estate; his eldest son Alonzo is a farm laborer. Five years later the Wrenches relocated to Fall River, Greenwood County KS; in 1900 John, Alexenia, and youngest child Bessie are living in Eureka, Greenwood County KS. ● According to ~f, Frances Lusby Brown Hutchinson and her only(?) child, Lulu Alto Hutchinson Williams, both died on Feb. 23, 1893 in Cincinnati. ● One ~f roster of the "Tosso" family excludes the two Jameses and mis-estimates most of the other children's birthyears: Louis c.1848, Carrie c.1850, Frances c.1852, Mary c.1854, Archibald c.1856 (correct), Adelia c.1858, Julius c.1860. 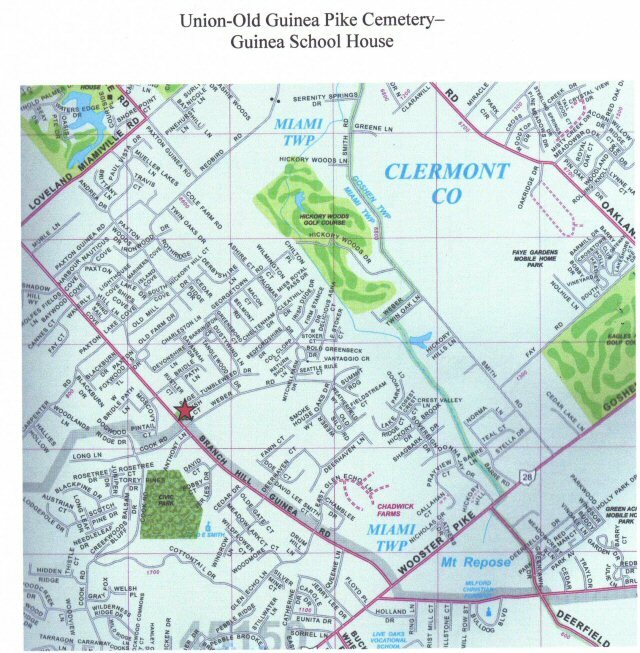 ● ~union's gravestone photos were provided by Pamela Smith of the Clermont County Genealogical Society, which has undertaken the herculean task of photographing every marker in all the county's cemeteries. Check out the CCGS and its progress at www.rootsweb.com/~ohclecgs/.